Is the Penalty Kill Back on track? Both teams went without a power-play goal in Game 4 for the first time in this series. The Bulldogs were 0/3 with the man advantage while the IceDogs were 0/4. Hamilton’s Arthur Kaliyev did get one behind Niagara goaltender Stephen Dhillon on the power-play, but the officials waived it off due to goaltender interference. The goose egg from both teams on the power play was in part due to both good goaltending, and strong defensive play on the penalty kill from both teams. Discipline will still be a key factor in Game 5. The Bulldogs have been very good at distributing the puck in the offensive zone throughout the playoffs. Hamilton has scored a number of beautiful goals that came off quick passing plays including the Bulldogs’ 1st and 2nd goals in Game 4. 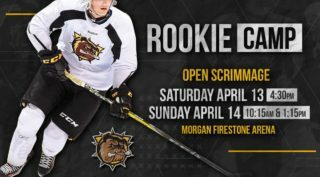 Robert Thomas lead the Bulldogs with 51 assists during the regular season, and despite missing Game 4 due to injury, Matthew Strome leads the team in playoff assists. Caamano has had at least a point in all 9 of Hamilton’s playoff games this year. His 9 assists is tied for 2nd on the Bulldogs, and his 12 points is 4th on the team. Caamano is also leading the Bulldogs in shots on goal with 37 through the 2018 playoffs. This is Caamano’s 2nd time playing in the OHL playoffs. In 2017 he played 5 playoff games for the Flint Firebirds recording 3 assists. Niagara’s Kirill Maksimov is on a 5-game point streak that has seen him score 4 goals and pick up 2 assists. Maksimov was the overtime hero for Niagara in Game 3. This is Maksimov’s 3rd time playing in the OHL playoffs. 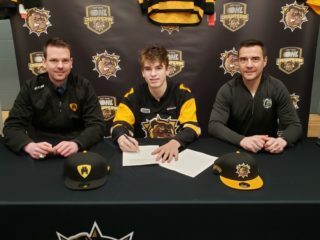 His 1st time was with the Saginaw Spirit in 2016, and the next 2 times (2017 and 2018) were with the Niagara IceDogs. The Edmonton Oilers prospect has 16 points in 17 career playoff games. 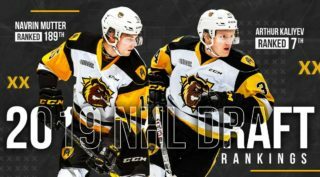 The Bulldogs were without offensive leader Matthew Strome in Game 4 due to an upper body injury. 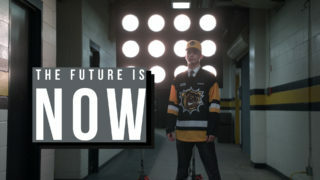 The Bulldogs thankfully got an offensive boost from Devils prospect Marian Studenic who scored 2 goals including the game winner and was the 1st star of Game 4. Arthur Kaliyev slotted in on Strome’s line skating with Mackenzie Entwistle and Isaac Nurse. The rookie had a solid game recording an assist and a shot on goal. Kaden Fulcher was lights out for the Bulldogs in Game 4. The Detroit Red Wings prospect made 24 saves in the game including a couple of key ones in the opening frame to keep Niagara from taking an early lead. Amongst goaltenders that have made at least one start in the playoffs, Fulcher is 2nd in goals against average, 6th in total saves made, and 8th in save percentage. Niagara goaltender Stephen Dhillon had his smallest workload so far in the playoffs in Game 4 as the IceDogs gave up just 26 shots against. Amongst OHL goalies with at least one playoff start, Dhillon ranks 2nd in total saves, 3rd in goals against average, and 2nd in save percentage. Mercedes Benz Burlington wants to give you the chance to win a Mercedes Benz for the weekend. Visit the Mercedes Benz booth at all Bulldogs home playoff games in front of section 117 on the concourse to enter.